Why should I not ignore the problem? The collapse of the facial structure can cause the face to “sink”, making you look older than your years. Patient before and after procedure to place implants and fixed prosthesis. The labial support and aesthetic appearance improve. In short, we rejuvenate him! Before, metal-porcelain crowns; after, zirconia-porcelain crowns: new materials that improve the aesthetic look by 100%. Patient whose teeth were compromised as regards mobility, aesthetic and functionality. After: an enormous aesthetic and functional transformation after extractions are made, and implants and a fixed prosthesis are placed on the same day. But, above all, greatly improved self-esteem! Young patient with agenesis of the maxillary lateral incisors. We convert the two canines into lateral incisors to improve the aesthetic appearance and place two dental facets, practically without needing to strip the teeth. Patient with aesthetic compromised and composite dental facets made 25 years ago. We replace them with new porcelain facets and transform his smile by 100%. Patient with teeth crowding and wear on the four upper incisors. We resolve the problem with three dental facets and a porcelain crown. Relaxed and satisfied, the patient can smile once more. Patient with aesthetic compromised due to gum recession and cracking of several teeth. We replace the broken teeth with implants and the old crowns with new metal and ceramic pieces. The gum-to-ceramic ratio is always important in cases like this one, as the patient always shows their gums. We replace the titanium implant pillar with one made of zirconia, level the gum by grafting and put two metal-free porcelain crowns in place. There is an enormous change, and the patient even also conserves tooth and implant. In cosmetic dentistry, we always try to be as conservative as possible. Patient with periodontal problems in the upper jaw, mobility and difficulty chewing. 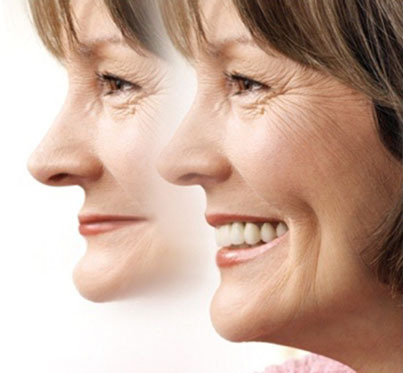 We perform extractions and place six implants and the fixed prosthesis, all on the same day. We save the moustache, too! Teeth whitening at the clinic using the American Zoom system. This is the result after the procedure, which takes approximately 90 minutes to complete. Orthodontic treatment using the Invisalign system. Result after 18 months’ treatment with this practical, aesthetic and hygienic system (there are three photos before, while the last three are after). Patient with a series of problems – occlusion, teeth crowding, tooth agenesis and so on. This is a multidisciplinary treatment that we can provide at our clinic as our team includes top experts in each speciality. First was treatment with conventional dentistry, followed by extraction of the milk teeth and placing of implants. Finally, the ceramic dental crowns and veneers round off this case with excellent results in terms of both aesthetic appearance and functionality.